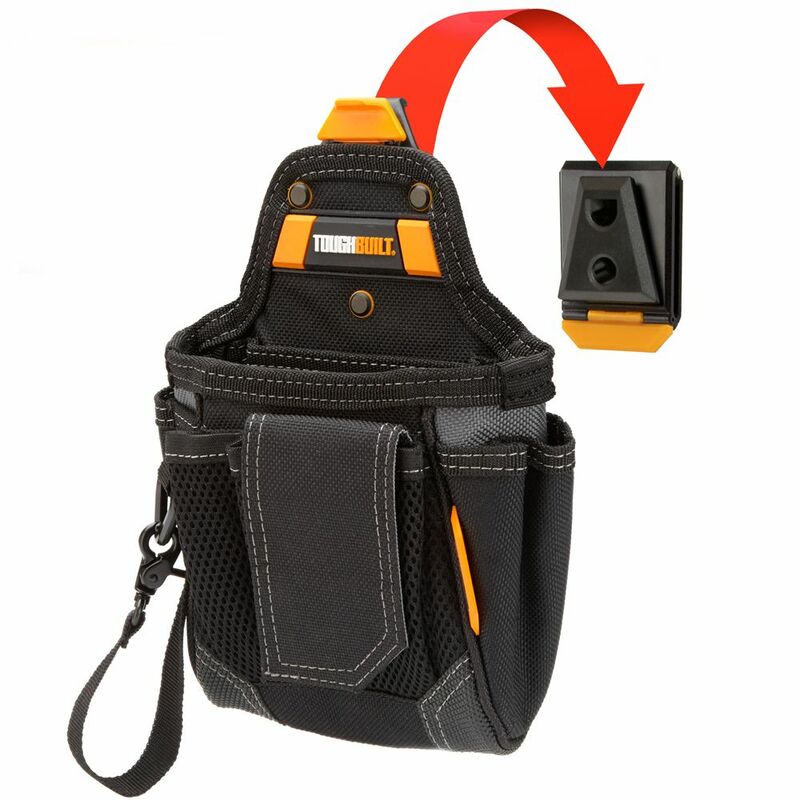 The ToughBuilt Warehouse Pouch transforms how professionals carry their tools. The patented ClipTech Hub allows this pouch to clip on and off any belt. Works great alone, or combined with any ClipTech tool belt. This pouch fits the ever-changing needs of the professional. Its 9 pockets and loops include a covered cell phone pocket, ToughBuilt notebook pocket, and tape loop with metal hook. With rugged construction and heavy-duty pocket reinforcement this reliable pouch withstands the most rigorous working conditions. The Husky 14-inch Rolling Tool Tote features a heavy-duty telescoping handle and two wheels for easy mobility. A large main compartment provides easy access to tools and accessories, while 13 storage pockets make it easy to keep your items organized. This rugged design holds up to 80 lbs. and is durably is crafted with water-resistant material, making it a perfect choice for rough job site conditions. Warehouse Pouch The ToughBuilt Warehouse Pouch transforms how professionals carry their tools. The patented ClipTech Hub allows this pouch to clip on and off any belt. Works great alone, or combined with any ClipTech tool belt. This pouch fits the ever-changing needs of the professional. Its 9 pockets and loops include a covered cell phone pocket, ToughBuilt notebook pocket, and tape loop with metal hook. With rugged construction and heavy-duty pocket reinforcement this reliable pouch withstands the most rigorous working conditions. Warehouse Pouch is rated 4.4 out of 5 by 15. Rated 5 out of 5 by DerwoodKirby from Overall pleased with this product. The quiklock works well. Pouch is well made from heavy canvas... Overall pleased with this product. The quiklock works well. Pouch is well made from heavy canvas and nylon. The notebook pocket is big enough to hold a large smartphone with otterbox case. The actual cell phone pocket is too small to me of much use. Would like to see a tape measure attachment here. The pen pockets are perfect and the larger outer pockets will hold a utility knife. Tape loop is pretty handy. The main large pocket is big enough for a test meter or several loose tools. Would buy again. Rated 2 out of 5 by MTree from The clip Will not hold on belt!!!! Too Tight.. Needs to be made a little bigger!!! The clip Will not hold on belt!!!! Too Tight.. Needs to be made a little bigger!!! Rated 4 out of 5 by WUNNEWORLD from This tool pouch is alot stronger than it looks. Very comfortable to wear...and super convenient t... This tool pouch is alot stronger than it looks. Very comfortable to wear...and super convenient to take off. Rated 5 out of 5 by RandomMonster from Great product, I love the over all design and the quick release lock, unfortunately the belt clip... Great product, I love the over all design and the quick release lock, unfortunately the belt clip itself wears down after use to the point it doesn't stay closed, especially when loaded down. I had a previous one that lasted about 9 months with extreme use, clip failed and quick lock failed but the pouch body was still solid, recommended the clip tech and now 90% of my crew use one form or another. Good product and product line! Rated 5 out of 5 by bob from perfect for tower climbing. clips fit on my petzl climbing harness. different attachments easil... perfect for tower climbing. clips fit on my petzl climbing harness. different attachments easily changed out.. great product..